"Life Journeys": Conversations With High Achieving Women In Kenya, Week 6 - Women of the Week. Conversations With High Achieving Women In Kenya, Week 6 - Women of the Week. Hello folks, welcome to yet another one of our blogs where we highlight three women, each week, who have made a difference in Kenya and beyond. Before we start, we are delighted to inform you that our second publication of the "Life Journeys" trilogy, is due to be out on September 3rd. The coffee table book, "Life Journeys: Scaling Heights," profiles 85 Kenyan men of substance. Just like it's sister, "Life Journeys: Seeking Destiny," each inspirational story, written by our young collaborating writers, is accompanied by Bobby Pal's stroke of genius; all men captured through his magnificent lenses. Priceless pictures of different faces of leadership. Before we proceed to our "Women of the Week," allow us to interject and share with you a letter sent to us by one of our achievers in the women's book. I am excited that the "Book for Men" is already ready for launch! Pass my Congratulations to Susan, Bobby and the whole Footprints Press team. we have a very busy clinic! It has been handled by all sorts of fingers and many hands! be torn away when it's their turn to see me or to see another Therapist. Text Book Center. That's where I've seen them. 2. To me: "When is the men's book coming out" I often answer -- "Soon". I'm writing a book on parenting and I'll quote heavily from the two books. I believe that my citations will market the books some more. role models and life values. The two books will continue to fill this vacuum. I hope to be there on Sept 3rd. Enjoy this week's "Women of the Week." Educationist and former Member of Parliament Dr. Eddah Gachukia has been the Executive Director of The Riara Group of Schools since 2000. In 2009, this stunning lady was honoured by The International Committee of the Fellowship of the Least Coin, for Outstanding Efforts in Education in Kenya. In 1997, she was honoured by H.E. President of Senegal for Service to Girls' and Women Education in Africa. It is hard to believe that she began her education career as a secondary school teacher of Thika High School in 1960. I found school easy and enjoyable, though it was irritating when I scored high marks in Mathematics and the male teachers said they wished I were a boy. I went to the African Girls' High School, now Alliance Girls High School and it proved to be an enjoyable experience. I was the mail girl, a coveted and delicate responsibility. At times, the letters I distributed were from boyfriends and I had to keep this a secret. The people who have influenced me most in my life are my teachers as I wanted to emulate them. I wanted to teach and it seemed I was cut out for it. My father and my colleagues at home and all over the world have also influenced me. I am also influenced by my husband, Daniel Gachukia, and my children. As women, we must recognise that we are created in God's image and we must never allow anything or anybody to put us down. We need to remain focused and never lose sight of our critical multiple roles in all sectors of life, especially the family. Media Personality Patricia Khiranji Amira-Sanders has been in the limelight since the early 2000's. She is currently the Host of "The Patricia Show" on MNet, and has participated in various fields of entertainment from being a Master of Ceremony for Safaricom, British Airways, and Miss World Kenya, to Presenter of Groove thing, Mid-morning and Afternoon Jam for Capital FM. "I attended Loreto Convent Msongari where I would say I was an average student, but even back then I loved the arts. I remember participating in the Kenya Music Festival and coming second. I also enjoyed Drama and Fine Arts and once won second place in a United Nations (UN) peace painting competition. In 2005, I revived an earlier idea for a television talk show. I shared this with David and we began to explore ways to make it a reality. We funded and recorded a pilot for the show in September when I was three months pregnant. Our family and friends formed the audience. A week after the pilot, I ended up in hospital, Which put a hold on our plans for television. We were blessed with Kaya's safe arrival in March 2006. One of the highlights in my life is having a baby. It gives you a sense of who you are as a woman and a whole different outlook on life. I have often struggled with a sense of self-worth, trying to make sense of my role in life and it has at times stopped me from saying what I need to say and doing what I needed to do. Jennifer Nafula Barassa is the CEO of Top Image. This entrepreneur started off as a teacher in Lenana School, where she was the first African female teacher. Her company was ranked 2nd in Kenya's Top 100 Mid-sized Companies in 2009/ '10, and she was Declared Leading Lady Entrepreneur by Nation Media and KPMG in '08,'09, and '10. As early as 1985 people told me I should get into business, but I was not interested. I liked the fancy titles, like Sales Manager, Business Development Manager, and having a company car and I was not up to taking such risks then. Growing up, Pamela Mboya's father was our neighbour. Pamela was sophisticated, educated and drove a yellow Volkswagen that I vividly remember. On alighting from the car she looked tall and elegant. I wanted to be like her. One of my life's highlights was when my daughter, Bidanya, won the MNet Face of Africa, Kenya Chapter Competition in 1999. I am proud of her and what she has achieved. She graduated from USIU with a degree in International Business Administration, and then proceeded to Pepperdine University in Carlifornia, USA to do a master's degree. She is currently a marketing manager at Tetra Pak, East Africa. 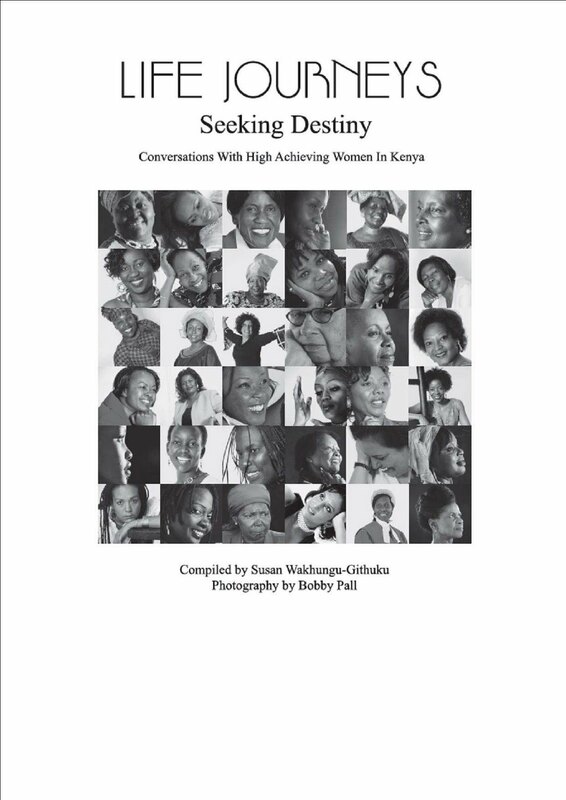 Read more of these stories and others in "Life Journeys: Seeking Destiny," a ground breaking coffee-table book that presents written vignettes of over 70 high-achieving women in Kenya. 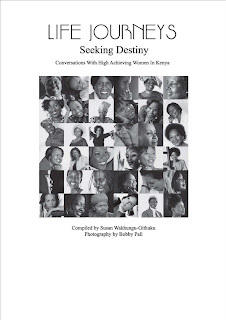 "Life Journeys: Seeking Destiny" is available at Bookstop in Yaya, Text Book Center in Sarit Centre, Savanis Bookstore in Westgate, Silverbird in Westgate, Prestige next to 20th Century, African Book Service off Koinange Street, Deacons, Lisa's at Muthaiga Shopping Centre, and ABC Bookplace Ltd. at ABC off Waiyaki way.